Once the kids are asleep, emptying an entire bottle of wine may help you recoup from your crazy day. But it can also inspire a little craftiness too when you discover things to do with empty wine bottles. From wine bottle oil and vinegar dispensers to chalkboard painted vino bottles, before you toss that used container into the recycling bin, uncork these DIY wine bottle crafts any mom can make. Whether labeling your munchies at your next party or simply making a statement in the center of your table display, chalkboard wine bottle crafts are not only simple, but reusable -- thanks to erasable chalk. 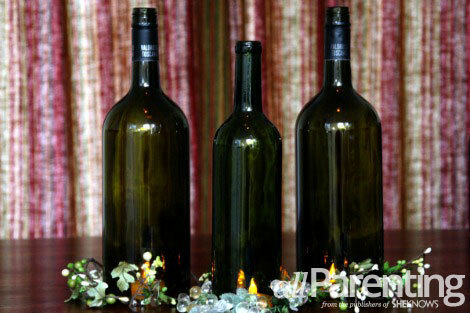 Soak your empty wine bottle in hot, soapy water to remove any wine bottle labels. Wash out the bottle and dry it completely. Place a tarp or drop cloth in a well-ventilated area. Place the wine bottle in the center and spray even coats of chalkboard paint horizontally first, then once again in a vertical pattern, taking care not to apply too heavily (or you'll end up with drip marks). Let it dry for about 10 minutes and repeat with a second coat. After you let it dry for 24 hours, use chalk to write your message or draw a picture. Erase with a soft cloth to reuse over and over again! Just because you've reached the bottom of your vino doesn't mean you're through with that glass jug of goodness. Repurpose them with this DIY craft to serve olive oil and vinegar at your table or house your dish soap in the kitchen with a simple pour spout addition. Insert a clean pour spout purchased at a kitchen supply store like Bed Bath & Beyond. Add labels, art, or decorate to your liking, using Mod Podge to water-seal the ornamental elements. 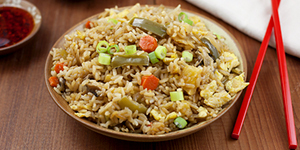 Use your new bottle to serve oil and vinegar at your next meal. With the right tools, this wine bottle craft will give simple candles a whole new look at your next soiree. Just use caution as regular candles will make the bottle hot, so LED candles are the safer bet for most mamas. Soak your empty wine bottle in hot, soapy water to remove any wine bottle labels (or leave labels intact as decoration). Following the directions on the bottle cutter, remove the bottom portion from the rest of the wine bottle and sand until smooth. Using the tool to score and alternating dunks for 10-second intervals between simmering water and iced water worked best for me. Place the dried, sanded wine bottle over an LED light and bask in the compliments! 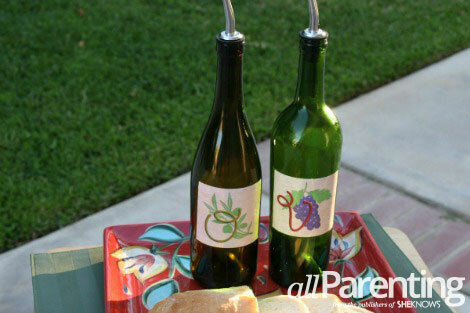 Looking for things to do with empty wine bottles that don't require much effort? With these DIY wine bottle lamps, they're guaranteed to sparkle regardless of how much time you decide to spend on them. You can keep the label as is or remove by soaking your bottle in hot, soapy water. Embellish by covering in Mod Podge and sprinkling with glitter, wrap with ribbon and adorn with self-stick jewels, or leave label intact to give a more wine-themed effect. Carefully feed the string of lights into the bottle, leaving the plug end hanging behind your bottle. If you're using one string to light more than one bottle, divide the number of lights by the number of bottles and fill equally. 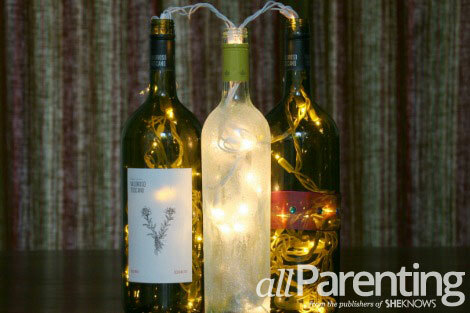 Plug in and watch your wine bottle crafts glow! Note^ You can also drill a hole in the back of the bottle to feed the cord from the string of lights more discretely -- but use caution as glass is very fragile. For these four DIY wine bottle crafts any mom can make, use goop remover to nix the last of the sticky stuff on the most stubborn of wine labels. That way you can focus your attention on emptying the bottles -- you'll need all the materials you can get your hands on now that you know all the things you can do with empty wine bottles!